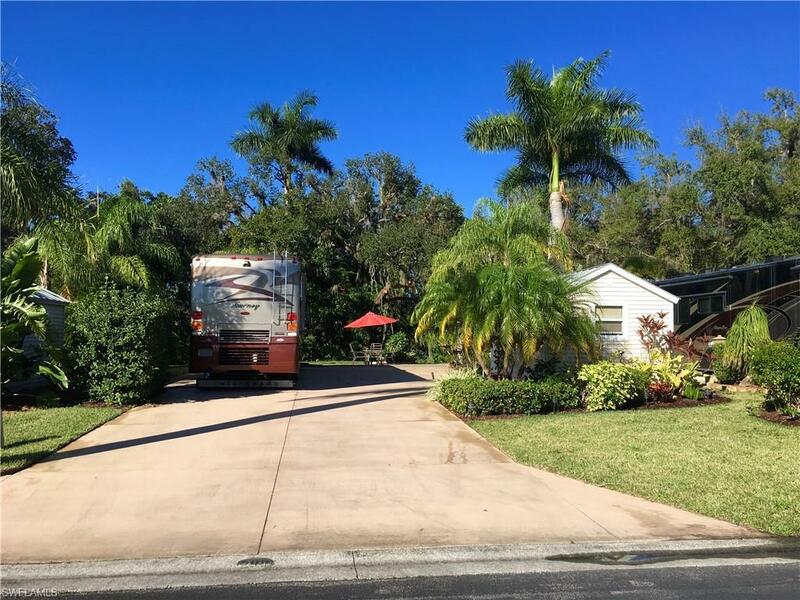 RiverBend Motorcoach Resort RV Lot 298 is located near the river boasting beautiful wooded views of mature oaks with spanish moss and lush landscaping surrounding the property. The beautiful paver patio provides a great location to relax in a private tropical paradise. It’s just a short walk to enjoy views of the river or the River Clubhouse for dining and entertainment. The 10x16 coach house is finished with french doors opening to the wooded area, laminate floors, kitchenette, refrigerator, new stacked washer/dryer, extra cabinetry, ceiling fan, A/C and a full bath. This gorgeous Class A Motorcoach Resort is full of friendly people and provides a special sense of community. The resort includes over 1000’ of river frontage on the Caloosahatchee River with boat ramp, slips and trailer/boat storage. There is a Welcome Center with gated entrance and 2 clubhouses that include restaurant, full bar, dining areas, billiard room, library, exercise rooms and laundry. Amenities include R/C Speedway, Railroad Village, Sailing Club, heated pool, 2 jacuzzis, pickle ball, bocce ball, volleyball, shuffle board, covered picnic areas, BBQ grills, putting green, horseshoes, crafts and a dog park.